Good afternoon! Before I address the theme of today's speech, "Realizing the Vision for National Recognition," I would like to recognize and thank our University community for the way that it has come to the aid of victims of Hurricane Katrina. Your response has superbly reinforced our values of Citizenship, Integrity, Openness, Wisdom, and, by application of these values, Excellence. Through your efforts, we are educating displaced students, assisting faculty from the distressed region, and raising money. We have also provided police services to support our fellow American citizens who have so profoundly suffered from the effects of Hurricanes Katrina and Rita. Please join me now in a moment of silence in remembrance of the victims of these horrific natural disasters. On October 7, 2004, I spoke to you about my "First Impressions of a Premier Metropolitan University." I thanked you for your kindness, generosity, openness, and friendship during my first months on campus. I admired the University's well-formed sense of community, clearly articulated values, and welcoming environment. I pointed out that these qualities were not produced by chance, but through the hard work and dedication of talented Edwardsville faculty, staff, and administrators. This October, I want to tell you how much I have come to appreciate these great qualities of our University community, and how grateful I am for the support you have all given me during my transition. I also appreciate all the contributions that you make as individuals, and the work that you do collectively, to achieve our vision. That vision, so proudly displayed alongside our values in the Goshen Lounge, reads, "SIUE, as a premier Metropolitan University, will be recognized nationally for the excellence of its programs and development of professional and community leaders." We are making progress toward achieving our goal of national recognition. Our increasing excellence has produced a corresponding increase in national rankings. I am pleased to report that again this year, we are included in the "Top Schools" category of the U.S.News & World Report rankings. SIUE is one of only 23 public universities of the 72 institutions listed in the Top Schools category. We are ranked 58th out of 142 universities in the Midwestern Master's Universities category. Only 15 of the 57 schools ranked higher than SIUE are public universities, and of those, only one is a metropolitan university. When peer-ranked for academic reputation by presidents, chancellors, provosts, and directors of admissions, our ranking is 38th out of 142. Only 13 of the 37 universities ranked above SIUE are public institutions and only one of the 13 is a Metropolitan University. Additionally, U.S.News & World Report cited SIUE for its Senior Capstone integrative learning experience required by all seniors prior to graduation. SIUE was one of only 15 universities nationally recognized in this category that includes Harvard, MIT, Duke, Princeton, and the University of Chicago. Our placement in this category comes from votes cast by chancellors, presidents, provosts, and deans of Admissions of universities throughout the nation, so it is a real measure of national recognition. Clearly, SIUE's strong tradition of quality liberal arts and sciences degrees and professional programs is gaining in recognition and reputation. Recognizing and affirming the emergence of SIUE as a premier Metropolitan University, last October I challenged us to achieve our stated goal of national recognition by 2015, with material progress to be made by 2010. I then held Town Hall meetings with University constituencies designed to learn what you believed is most praiseworthy about SIUE, what you thought needed improvement, and to determine how we see ourselves compared to how the external community sees us. I promised I would listen in these meetings and in other venues to your input regarding our University, and I pledged to report back to you what I'd learned and propose steps we can take to achieve our vision. Last October, I identified three initiatives to be undertaken immediately. First, I indicated that we would further align our enrollment management program to attract a student population that is characteristic of a premier Metropolitan University. I promised that the Enrollment Management Council would work to attract and retain increasingly better academically prepared students who could be challenged by our fine faculty, while maintaining our commitment to diversity. Just as excellent students seek a well-prepared and committed faculty, an excellent faculty seeks well-prepared and committed students. I also announced that we would assemble a Housing Task Force to assist us in achieving our enrollment management goals. By last October, the process of attracting more academically prepared students had already begun. The national average ACT score was and remains 20.9. The state average continues to be 20.3. The average ACT score for the fall 2004 SIUE freshman class was 22.3, up from 21.9 in 2003. For this year's freshmen, the average ACT score has risen to 22.5. While applications to the University increased by 12% last year, we have become more selective in our admissions by raising our standards and establishing earlier admissions deadlines. This fall our full-time equivalent student enrollment of 10,964 is up almost 200 from last year, reflecting the fact that we are becoming more of a full-time student enrolled campus. Our base has expanded to include more students from the Chicago area, from downstate regions beyond Madison and St. Clair counties, and from the Missouri counties outside of St. Louis City. With regard to housing, in less than one year our Task Force recommended that we build a fourth residence hall, provided oversight for the development of plans, and worked with architects to design the building. And I am pleased to announce that the Board of Trustees approved our request to secure funding for a fourth residence hall for 500 students last week at its regular monthly meeting. It will be built on Circle Drive across from the Art & Design Building with occupancy scheduled for fall 2007. This is good news for our students. In this year's freshman class, we had 300 students on our Housing waiting list in July, and at least 80 students made the decision not to enroll at SIUE due to a lack of housing. We have approximately 2,500 students living off campus, away from home, in various communities for the sole purpose of attending SIUE. In fact, roughly half of our full-time undergraduate students may now be considered "residential" when both on- and off-campus resident students are considered. Other results of the discussions I have had are embodied in the work of task forces and groups recently formed to study various key aspects of University life. These include a working group established by the Provost to study ways to increase graduation rates. Only 43% of SIUE students who started in 1998 graduated in the six-year reporting period. Although that is better than the 38% who started in 1996 who had graduated by 2002, a six-year graduate rate of 43% is not viewed as being characteristic of a premier Metropolitan University. In fact, the graduation rate for SIUE is the lowest among the 72 Midwest master's universities in the U.S. News & World Report's Top Schools categories. We simply must make increasing graduation rates a priority for our University. An honors program task force will study and make recommendations for the re-design and implementation of a University-wide honors program. A premier Metropolitan University should have an honors program that focuses on attracting and fully engaging high-achieving students. Yet another task force will study the continuing role of athletics on campus. Building on a 1999 task force report, this task force will make recommendations about the future of intercollegiate athletics at SIUE by considering three options: staying at Division II, moving to a mixed Division I/Division II model, or playing intercollegiate athletics at the Division I level. The task force will consider the financial and university-wide impact of these options and prepare a draft report in fall 2006. The second initiative I announced last fall was to strive to position SIUE as a premier Metropolitan University in the marketplace of ideas. I indicated that we would survey stakeholders including faculty, staff, and members of the external community to develop a campaign to communicate who we are. Your observations and suggestions have stimulated thinking among all of us about our shared vision for the University. Your comments, along with survey input from students, alumni, and parents of alumni, have been used to develop an integrated marketing plan to represent who we are, and to communicate it on radio, television, and the Internet. The resulting "E-campaign," with the letters SIU followed by a bold "E," may be accessed from our Web site. If you click on the SIUE icon on the site, you can view the media advertisements. I hope you will take time to do so. It is imperative that we break through the clutter of competing messages in order to make ours visible and audible in the public marketplace of ideas. The survey results told us that we are well known for being affordable, convenient, and for offering a beautiful campus. We are less well known for excellence and quality. So, as with everything we do, the ultimate objective of these efforts is to communicate, foster, and sustain academic quality. We must reinforce our message to attract students ready to be academically challenged and to enhance the intellectual life of the University. We do not seek to create an image for its own sake, but rather to reflect a justly earned reputation for the academic quality we have achieved. Your comments about the importance of our beautiful campus have been most appreciated. You will notice that it will become even more beautiful as we add new plantings and landscaping. We are also in the process of making our campus more accessible and more clearly navigable for visitors. We intend to change the signs at the major entries to more clearly identify entrances to SIUE and to make navigation around the campus easier. Once visitors are on the campus, they will find improved directional and building signs to guide them. We expect this initiative to be complete by January 2006. We have also installed parking places in front of Rendleman Hall for visits by prospective students and their parents to our Admissions Office. The areas of the Hairpin Drive, Rendleman Hall, the surrounding buildings, and also the grounds, are viewed by campus visitors as our "front door." Our virtual front door, our Web site, is also being completely redesigned and the new site will be accessible soon. A premier Metropolitan University should have a first-class appearance, as should our Web site. Appearance, accessibility, and ease of navigation are crucial to visitors and prospective students and their families. And, they are equally as important to those of us who work and live on the campus. The third initiative I announced last year was to develop our resource base. I indicated that we could not wait for the economy to improve, or for state support to achieve what we believe is some optimal or at least necessary level of funding. While we are state assisted, we cannot say that the fulfillment of our Vision Statement is solely dependent on the level of state funding. We are the writers, stakeholders, and responsible owners of our vision. And we must prepare to achieve our vision with what we are given and with what resources we can develop to augment what we are given. I promised that we would work hard to pursue all possible resources to accomplish our goals. This year, we have begun to fulfill that promise by launching a feasibility study for a major capital campaign. Working with the deans who, in turn, are consulting chairs, program directors, and faculty, we are establishing a prioritized list of needs for funding. External consultants will examine the development infrastructure of the University to see if we are ready to mount a fund-raising campaign and then test our prioritized list of needs with potential donors. From this process, the University will develop a case for external support and determine the size of the capital campaign in which we will engage. The feasibility study will be completed during spring semester, and I will have more to report to you later. With respect to grants and contracts, the Graduate School is seeking new ways of encouraging and supporting faculty to write for support. We will continue to recommend that faculty who can obtain grants and contracts in their disciplines attempt to do so. We must also consider the relative placement of our tuition costs with respect to those of other state universities. Currently, we have the second lowest tuition among public universities in Illinois. Last spring the University Planning and Budget Council and the Deans' Council supported a plan to enhance revenue by a total of $3.5 million by accelerating tuition increases over the next two years. I presented this concept to the Faculty Senate last spring and again this fall, and I have spoken about it with the Board of Trustees. I will also be sharing this enhancement idea with our Student Senate and Staff Senate. We will not know if this revenue-enhancement plan will be approved until the Board meeting in the spring, but I do want you to know that I will be supporting its adoption. In addition to gifts, grants and tuition, the enhancement of the resource base for SIUE can also be influenced by the University's role in regional economic development. Our university is an economic engine for this region. Our nearly $185 million budget and ancillary expenditures in the region by those who live, work, and visit have a significant impact. We will soon complete an economic impact study prepared by the School of Business faculty, and we will publish their findings. But, there are other ways we have an effect. SIUE is funded to educate students. Our faculty serve as teachers, scholars, and practitioners in their disciplines. Faculty and students who participate in research create a valuable form of intellectual capital, and use of their expertise can play a catalytic role in economic development. A new position, Executive Assistant to the Chancellor for Regional Economic Development and Director of University Park, created from the current Director of University Park position, will work with faculty to coordinate mutually helpful economic development relationships in the region; direct institutional initiatives; identify emerging issues; conduct research negotiations; develop public/private partnerships; and direct, promote, and market the University Park. Assisting in economic development is only one way that SIUE is keeping its covenant with the citizens of Madison and St. Clair counties who, almost fifty years ago, fought so hard to bring the University into existence. In 1957, the Southwestern Illinois Council for Higher Education argued, "An investment in a central university campus would be a living endowment for this area. . . . [that] will enable business, industry, government and other organized forms of human endeavor to function more efficiently and to grow creatively. Similarly, the area will profit from the educational enlightenment of people in all walks of life, whether their contacts with the university and its scholars be in the classroom, the laboratory, the concert hall, the conference room, or in their homes and communities." It is small wonder, then, that SIUE's first "Chancellor," John Rendleman, said, "From its beginning, this institution was of, by, and for the community." For our metropolitan area, he continued, "we have been a promising beacon of hope." I believe we must continue to be that beacon. If we believe that education and innovation provide answers to the challenges of globalization, then we must provide effective models for the utilization of education and innovation. What I have learned in Town Hall meetings, discussions with many of you, formally and informally, and what I have summarized in the last few minutes, only notes a few of the developments that have occurred in the last year in our dynamic, growing University. For example, we have added four new Master's programs: a Master's in Biotechnology Management, Environmental Science Management, Literacy Education, and a Master of Arts in Teaching. We are also planning to implement a new Freshman Seminar Program in the next two years. The freshman seminar experience has been shown to correlate highly with the retention of freshmen since it bonds them more fully to the University community. While the Freshman Seminar Program is being developed, a review of the General Education program is now being initiated by the BRIDGE Committee. The BRIDGE Committee will lead a faculty-initiated process to keep SIUE advancing in its goal to achieve excellence in learning, and I am pleased that its work is off to such a good start. When we take our message of who we are and what we do to potential students and donors, we can point with pride to many examples of excellence on campus. As you know, excellence is both one of SIUE's values and strategic goals. Last fall, I noted that we strive toward excellence in all things, but that we had already achieved excellence in many. I cited some examples of academic programs, and the accomplishments of faculty and staff in the arts and sciences, library, engineering, pharmacy, business, nursing, education, dentistry, and in service to our students. Your comments in our Town Hall meetings made me aware of even more such instances. We have an abundance of dedicated and high quality faculty and staff whose achievements have not gone unnoticed. Many of these I mentioned last year by name, and I will again in the future. Today rather than naming individuals, I want to focus on our entire University community and realizing the SIUE vision for national recognition. Today, I want to engender discussion of what we want our University to look like and be known for when we achieve national recognition. While we will always serve our region by accepting quality transfer students, the academic preparation of our first-time, full-time freshman class will continue to improve and thus increasingly characterize us as a Premier Metropolitan University. In the near term, we will hold our freshman class at 1,700, and the purposeful development of our undergraduate, graduate, and professional programs will result in controlled overall enrollment growth. Building on our outstanding reputation for the senior capstone experience, SIUE will enhance its overall reputation as a university committed to maximizing student learning. As such, we will continue efforts focusing on the freshman experience, advising, General Education, honors, major programs, and the attendant requirements of the library in support of our progress. The General Education review now initiated by the BRIDGE Committee, I believe, will result not only in the revision of programmatic content, but also in a discussion of the value of General Education to a 21st century undergraduate degree and consideration of the pedagogy associated with how we'll teach General Education courses to maximize learning. SIUE will become a more residential campus, expanding its summer program and opening its residence halls during the summer to become recognized as a 12-month University. This will help more of our students to graduate within the four years of the guaranteed tuition plan. In fact, all of these actions will improve materially the graduation rate of our students as we think more broadly about the total educational experience of students at SIUE. Our graduate level programs will flourish as more certificate programs and applied professional degrees will be developed by our faculty and offered throughout the region. Our faculty will continue in the teacher/scholar model, and we will be known as a University with quality teachers who are also adept practitioners in the scholarly pursuit of their disciplines. A strong commitment to faculty scholarship, essential to a premier Metropolitan University, will be exhibited by a faculty who know well that scholarship contributes to quality teaching. Maximizing learning will characterize all of our schools and the College of Arts and Sciences, and we will be known as an efficient, productive, and effective institution. Our Student Affairs services, Administrative support services, and University Relations initiatives will be excellent supporters of our progress, and they will parallel developments in the academic arena with innovations of their own, further characterizing the distinctiveness of the educational experience at SIUE. Our campuses in East St. Louis and Alton will expand their reputations for community outreach and services. We will have active support from regional citizens as they increasingly recognize the value of our work and their support of the University will increase both in material and non-material ways. Our alumni, many of whom will continue to reside in the area, will recognize that the value of their degrees is increasing yearly, and they will become more actively engaged partners in our work. 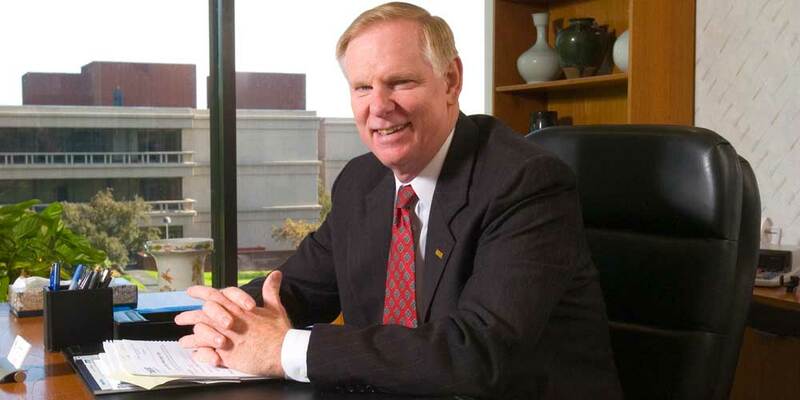 SIUE will be known as a university on the move to fulfill its mission. What I have just presented is not a finished blueprint for our university, but a brief sketch of where our strengths, values, and strategic goals will lead us. National recognition for what we do best is our vision; how we achieve it is our responsibility. Can we achieve it while maintaining the diversity, community, and values of our campus? I believe so, but we'll need the help and input of everyone in charting our course. In the words of Katherine Dunham, "I always believed that if you set out to be successful, you already were." SIUE is a product of its past, and yet we also live in a creative, dynamic present in which we eagerly anticipate our future. While we are a product of our past, we are not what we were twenty-five, ten, or even five years ago. And, we will not be, fifty years from now when our one hundreth anniversary is celebrated, what we are today. It is our challenge to plan for and accomplish our future in ways that best serve the citizens of Southwestern Illinois and our students. I know that we can continue to improve and, at the same time, I know we can achieve national recognition for what you have achieved and will accomplish. I remain absolutely determined that we will achieve that recognition within the time frame announced last year: to make material progress toward national recognition by 2010 and to achieve that goal by 2015. At SIUE, our glass is more than half full. We have wonderful people who will make our vision a reality. We must all be players in the process, if our future is to be an intentional future. The purposes of higher education lie in the fulfillment of human potential. We add value to people's lives. Since higher education is inherently a people business in the end, it is people who make the process successful. And, it is your successes that are moving us forward. I invite you to continue with me on this exciting journey. I look forward to discussing with you what I have said today. I will be scheduling lunches, open forums, and will send e-mails periodically to keep you informed of our institution's progress. I appreciate all of your contributions in leading our premier Metropolitan University to national distinction. Thank you, and GO COUGARS!